The Vision condominium. Positioned right on top of Pratumnak Hill, this new high rise tower (completed in 2016) rises atop the horizon. It has breath-taking panoramic sea-views from the rooftop infinity pool, sky lounge and fitness centre which are all on the 20th floor of the building. This fully furnished 38.5sq.m property is located on the 5th floor of the building. The inside of the unit is very modern, with fashionable high gloss built in furniture in the living room to match the European kitchen cabinets, and there is also stylish wallpaper throughout. The bedroom also has built in furniture and wardrobes. You can easily commute to the city as public transport is immediately available right outside the building. 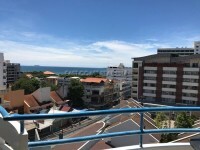 It is also a very short walk down the hill to Cosy Beach, a beautiful small bay with a handful of beach bars, and views across the sea to Koh Larn island on the horizon. For long term rental only. A 2 month security deposit and 1 month advance rental will be required prior to check in.